So, why have traders been moving to their platform? Check them out a deribit.com and you can get a 10% discount for the first 6 months. PLEASE NOTE: Deribit is not available for US citizens. Peter McCormack: Hi there, Hester. Thank you for having me over here at The SEC. Hester Peirce: It’s so nice to be here today. Thank you for making the trip over to come talk to me, and just want to start by giving my disclaimer, which is that the views that I represent are my own and don’t necessarily represent the views of The Commission of my fellow Commissioners. Peter McCormack: Okay, fantastic. So I have a nickname for you. Peter McCormack: Yeah. So, when I was preparing for my interview, I had a nickname and I’ve got you down as the great dissenter. Hester Peirce: I’ll take it. I like crypto mom. Hester Peirce: But the great dissenter works. Peter McCormack: Yeah. So I’d never heard of the term dissenting before I saw your response to the ETF rejection. So can you explain what dissenting is as a process? Hester Peirce: Well, dissenting has a pretty long tradition at The SEC. So just for some background, The Securities and Exchange Commission is made up of five Commissioners one of whom is the Chairman. So, it tends be a balanced Commission. So it’s politically balanced. So, you get a lot of different viewpoints and that means that sometimes you get people who don’t agree with a decision of The Commission. In those cases, you can vote no and at times people will do a public dissent, and that’s what I did in the case of the ETF application. Hester Peirce: Well, I think what I’m concerned about is that we have a really dynamic economy and we’ve got lots of people with really interesting ideas. I think as a regulator, we have an important role to play. But our role is not to stand in the way of innovation. So I want to be careful to stick to our statutory mandate, which is to uphold the statutory framework and make sure we have a specific mandate. I want to make sure we stick to that mandate, and then allow innovation within that mandate as much as possible. And I’m concerned that in a number of areas, we stray away from that and we try to become a little bit more interventionist in what we allow and don’t allow, and I think that’s not really where we belong. Peter McCormack: Okay. So, I think the way we should talk about this, let’s first talk about The SEC, allow people to understand what they do and what your role is and how The SEC works. And then maybe we’ll start looking at a couple of the key issues that have come up recently. So, if you could firstly just explain to me who The SEC is, why they are relevant, and what your role is within The SEC. Hester Peirce: Sure. So, The Securities and Exchange Commission is the regulator of the capital markets in the United States. We also have a sister regulator, the Commodity Futures Trading Commission, which regulates part of the capital markets, the futures markets. But we regulate the securities markets. And in that role where we’re involved in investor protection. We try to maintain fair, orderly, and efficient markets and then promote capital formation. That’s our threefold mission. So we operate under a number of different statutes, and we regulate everything from broker dealers, to stock exchanges, to offerings of securities. Hester Peirce: In my role, because it’s set up as a Commission. So as I mentioned, there are five of us. We’re actually the ones that vote on decisions. So whether that be a new rule coming out or an enforcement action, it’ll be the five of us that vote. Hester Peirce: Now there’s a lot of work going on done by others on the staff, not us. So the work that they do rolls up into the recommendations they make to us and then we ultimately vote one way or the other. Hester Peirce: And then another important thing to know in this area is that the staff can actually provide guidance about things. So there’s a lot going on at the staff level that will be informal, little bit more informal interactions with people out with regulated entities for example. They’ll be providing guidance about maybe how to comply with the rule. And that’s not official Commission level guidance. So it’s not an official position, but it can be very useful to people who are trying to figure out how to comply with the rules. Peter McCormack: Okay. So staff can make a decision and sometimes the Commissioners may reject it or choose to make a vote on it. Peter McCormack: How does that decision come about? Hester Peirce: Well, so there are specific rules that govern that. It can about in the sense that someone who’s affected by the decision asked The Commission to review it or it can be that one of the Commissioners might say, “Hey, I’d like to review this.” So there are different ways that can come about, but that can sometimes lead to a little bit of confusion on the outside about what might be going on. Peter McCormack: If you haven’t got a firm agreement, you have a vote? Hester Peirce: Yeah, right. So typically, if a staff level decision gets pulled up for The Commission, The Commission will have a vote on it. Peter McCormack: And is it four Commissioners, did you say? Hester Peirce: Five. It’s five, but one of them is The Chairman. So he’s in a different role. The Chairman actually sets the agenda for The Commission, so he has a very important role. Our chairman is Jay Clayton, and he plays the role of setting the agenda and he manages the staff. So, he is a Commissioner, but obviously plays a very important role. Peter McCormack: And am I right to say on one of the ETF decisions, the vote was three to one. Hester Peirce: Well so the one that I dissented on, I was the lone dissenter. Peter McCormack: So, if that had been a two, which Jay then have had the deciding vote? Hester Peirce: No. So there are times. So typically we’re at five. There are times when there’s a slot open, and then we’re at four. Peter McCormack: What was your personal journey coming to The SEC? How did you end up here? Hester Peirce: So I ended up going to law school a little bit on a whim. Not really with a big plan in mind of what I wanted to do. But when I came out of law school, I had majored in economics as an undergrad and I liked the idea of merging the two, law and economics. I thought securities is a good area to end up in. And I ended up going to affirm that did a lot of securities work, so that helped as well. 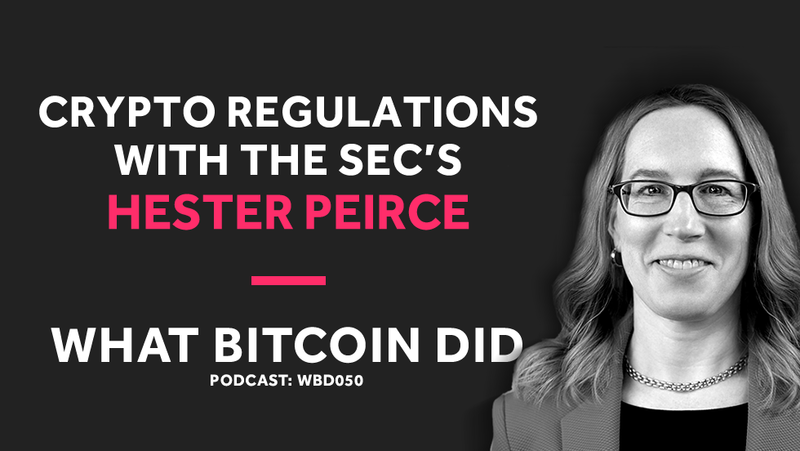 Hester Peirce: So, I was there for a bit and then I heard about, there were a lot of people actually at that firm had worked here at The SEC. So, I heard about an opening at The SEC and I came over here for eight years. And then I left. I worked on Capitol Hill for a little bit, worked in the Senate. Then I went and worked at a university here in the DC area, and then had the opportunity to come back here. Peter McCormack: You’re sworn in by The President, right? Hester Peirce: No, The President doesn’t literally swear you in. So, The President nominates Commissioners, and then we go through Senate confirmation. And then you get sworn in, but it’s not actually the president who does this work. He’s got other things to do? Peter McCormack: I see he signed your thing here. Hester Peirce: Yes, my Commission. Peter McCormack: Your Commission there. Is that quite a daunting process to go through? Hester Peirce: It’s a long process. In my case it was particularly long because I went through it twice before I got confirmed. Peter McCormack: So, you really deserve it now. Hester Peirce: Well I don’t know if I deserve it, but it was a long process. Peter McCormack: And before we get onto the other topics, your background being aware of and understanding both cryptocurrencies and Bitcoin, where does that come from? And also we should probably get the position clear. It’s not necessarily that you are pro-Bitcoin, but you’re pro-innovation, right? Hester Peirce: I’m pro-innovation and I think there’s a lot of promise in cryptocurrencies and this new technology. So I’m excited to see what happens with it, but of course I’m not going to take a position on which aspect will be successful or not. So my introduction to Bitcoin came when I was at the university because some of my colleagues worked on that area and knew quite a bit about it. So it was fun to learn from them about what they thought the potential was in that area. Hester Peirce: But I think in terms of learning about the topic, it’s a big learning curve. So I’m constantly trying to listen to podcasts that discuss the issue and talk to people who are knowledgeable about it, but obviously as I mention, there’s a lot within my mandate, so I’m trying to follow many issues. But always happy to talk to people. So I put a plug in for that. Anyone who wants to come by and talk to me would love to learn more from people who were actually engaged in. Peter McCormack: Are you a Hodler? Do you have any Bitcoin? Hester Peirce: No, I don’t. And the reason that I don’t is I think that it, I don’t want any questions about my objectivity. So I just put it out there that I don’t have Bitcoin or other crypto. I think it’s better that way. We have to be pretty careful about what we invest in any respect. Peter McCormack: It might come a day where you will have to because it will become a primary global asset. Peter McCormack: That’s possible. And just one last question before we start looking at the issues. I think people in the world of Bitcoin and crypto think this is all The SEC does, and everything is about crypto, but I’m sure you’ve got a number of other things on your plate that you’re always looking at. Hester Peirce: Yeah. So this came home to me recently. We did a rule on mining, not crypto mining, but actually mining mineral mining. Hester Peirce: So I wanted to send out a tweet about it, because this is a pretty important rule making for what it is. But I wanted to make sure that people didn’t think it was about crypto. So I put non Bitcoin in the tweet and that confused people even more because then they thought it was about other coins, not Bitcoin, but other crypto. So then when they actually looked at it they said, “Wait, this looks like it’s about mining.” That’s I think an example of the fact that we do lots of different things. And so some of this area falls within our purview. Hester Peirce: I think it’s important to remember that the US is a complicated regulatory framework. So even for people within the US, but I think especially for people looking in from the outside. So we have a lot of financial regulators. And we not only have financial regulators at the federal level, but we have state regulators that are active in this space. So it can be a really daunting thing not only to understand what the framework is, but then to figure out who you need to interact with to do what you’re trying to do. And so I’m certainly sympathetic to people who are a bit overwhelmed by it. Peter McCormack: Yeah. So as I mentioned this morning, I was with Peter van Valkenburgh over at Coin Center, and he was explaining to me the number of regulators there are. But also with for example money transmission licenses, you need to have 53 of them. No, 52 because essentially you need one in every state apart from, he told me one that didn’t, Missouri or somewhere. But he said that’s a real problem for people, especially with something like Bitcoin, which you can send anywhere at any time. And his hope was that at some point that money transmission licenses would become federally regulated. Hester Peirce: Yeah. There are a lot of people who have suggested that in the states have a role to play in the system that we have set up now. Peter McCormack: Okay. So, let’s talk about what people are going to want to hear about, which is ETFs. Obviously, as I said to you before you came on my radar with reference to the Winklevoss ETF, which was rejected. I’ve read through your statement and there were three key areas. So we’ll unpack those. So the first point you said is that you felt that the proposed rule change satisfied the requirements of the exchange act section 6B. Should we talk about that? Hester Peirce: Then I start to say well, is that really … Clearly the exchange has thought about the unique features of the underlying market and they’ve tried to figure out how their product will work, taking those into account. And there were protections that were built in thinking about the market. So my concern is that we focus on the market at issue here, which is the exchange and the exchange traded product and not stray that. I think there are also our concerns that we sometimes look at crypto and we say well it is very different from any other asset class. And that’s to some degree true, but I think there are similarities with other asset classes. If you look at something like gold, there’s some similarities in the sense that you have a lot of different marketplaces all over the world and some of them are more transparent than others. Hester Peirce: So I think we have to be careful not to place concerns out there that we haven’t really placed on other asset classes. Now to be fair, some of these same issues were looked at in connection with gold and other types of things. But I would argue maybe we went too far there too. So I think we need to hew pretty closely to our statutory mandate. And I just interpreted it differently than my colleagues did. Peter McCormack: Yeah. And I found the second point even more interesting where you said the disapproval order inhibits institutionalisation essentially, the asset. I put myself at brackets. Thus it kind of inhibits investor protection. So what I put down is this chicken and egg. Because with the institutionalisation of the products, we’ve have more liquidity, we have more innovation, we will have better investment in custodian solutions, and we will have a more stable market. And the market operators will be incentivised to operate a more transparent and open market, but it’s not going to achieve that without institutionalisation. So it’s about this chicken and egg situation. Hester Peirce: Yeah, it is. I do feel that it’s the same way. I think it’s interesting in this area because there’s some people who really don’t want institutionalisation in this market, in the underlying market. I understand that too. There’s a community that says we really don’t want this to be intertwined with the more traditional financial system. But there are a lot of people who are saying we think this is something that a lot of investors want to have exposure to. And a lot of people want to have in their portfolios. And if we do bring in institutions, to your point it’s going to change the markets. It’s going to add some discipline to the markets because institutions understand markets very well and they’ll be able to push back and say, here are some changes that we think are important. So I think that that can be a very valuable as you put it, investor protection and it can be a way ultimately for retail investors maybe not right away, but ultimately for retail investors to engage with the market, with the help of some institutions. Peter McCormack: And I think you also pointed out that it isn’t really The SEC’s role to decide whether Bitcoin will be a product or not. That is down to the market. And I think you said they will do a better job than The SEC anyway. So you just want the market to play out itself. Hester Peirce: Yeah. This is my broader philosophy is that it’s never good for the regulator to say, “This product is good, this product is bad. We think investors should be here and not here.” Because ultimately one of the beautiful things about the market is that it brings together lots of different perspectives from people with all kinds of different information. Whereas we as a regulator come to it with one perspective and with limited information. So I think really, we want to incorporate as many voices into the marketplace as possible. I think this is one of the neat things about Crypto, which is that you are bringing together people from all over the world, and they’re able to express their views about this one will be successful. This one won’t be. They’re able to in a lot of these things, they can weigh in, the community can weigh in as to which direction something is going to go. And I think that’s really an interesting development because it does pull in information from all over the place. So that’s what I want to see happen and I don’t want to see decisions about success or failure centralised at a regulator. Peter McCormack: And then the last point you made was the disapproval order dampens innovation. And is there a fear there that certain entrepreneurs or certain investors will start looking to foreign markets where maybe there isn’t such a tight regulatory lens? I mean Malta has been very successful in attracting companies there. Is that a fear of yours? Hester Peirce: So I think we need to just remember that there’s an important role for regulators to play, but there’s also this very important role for innovation to play in improving all of our lives. And so can we get that balance right so that we tell people we’re really excited about the fact that you want to innovate and we want to work with you to make sure that our regulatory framework works in a way that you can innovate? We’re not interested in fraudsters, we’re not interested in people who are just trying to rip people off. But people who have really interesting new ideas and want to try them out on the market, we want them to come here. Peter McCormack: It does actually feel to me though that The SEC have been pretty fair up until now at almost everything they’ve done. I was with Jesse Powell from Kraken recently. He commented the same. It felt almost like The SEC itself has taken a very soft approach almost to let the market play out and see which items you need to focus your attention on. Is that on purpose? Hester Peirce: Well, so I think we certainly have people here. So chairman Clayton has been very good about bringing people in who have knowledge in this area. So we have Bill Hahnemann who’s from Silicon Valley, comes with a real understanding of obviously the role that tech plays in our economy and the role that innovation plays. And then we have someone who is responsible. She’s oversees, our crypto initiatives across The Commission, Val Szczepanik. She also has been I think widely respected because she brings a deep knowledge and interest in this area and has I think led the agency in, in taking a cautious, careful approach. So that’s great and I think it’s really important that we’ve gone after some of these people who have just said that they’re crypto and then they steal people’s money, right? So that’s clearly something that we’re going to go after and try to stop. Hester Peirce: And we have been more deliberate in taking actions against folks who are not engaged in fraud, but are not complying with our rules. Right? So we also have to tell people, “Look. Just because you’re calling something crypto, doesn’t mean that you can ignore the rules that we’ve had in place for many years.” So we are trying to get that balance right. And I think we’ve done a lot of things right in this area, but I do think that we also need to be a little bit more willing to open the doors a little bit wider to innovation. So that’s what I’m pushing for. Peter McCormack: Yeah, I was with Jake Chervinsky last night. I’m not sure if Jake, he’s a lawyer. He said to me what people don’t seem to understand is that securities laws have been here for a long time. It doesn’t matter if it’s crypto asset. If it’s a security, it is a security correct. Peter McCormack: And people seem to have missed that. So I’m going to have some questions for you on that as well. I just want to finish on the BZX. Peter McCormack: What’s the current status of that now? Whilst it was rejected, it’s still open, right? Peter McCormack: Is this on the website? Hester Peirce: Yeah, you can weigh in on the website. Peter McCormack: Do you read all the comments? Hester Peirce: I have read a lot of the comments, but I haven’t read all of them. We get lots of comments and lots of things. But I will tell you that comments are extremely useful, especially if there’s something a little bit deeper than, “Approve a Bitcoin ETP please.” It’s really helpful if people actually try to engage and wrestle with some of the issues that we’re wrestling with here. That can be very instructive to us. So I’m always eager to read letters from people who have put some thought into it. Peter McCormack: There are some funny ones though. Peter McCormack: So therefore, is someone like Coin Center very helpful for you then? Hester Peirce: We have really benefited from a lot of people across the spectrum who have weighed in from a very thoughtful perspective and who have tried to think through some of the issues that are difficult and provide colour. And so across the spectrum we’re getting lots of valuable input. Hester Peirce: The one thing that I will say just in general is it from my Twitter feed, I get a lot of requests to give a comment on timing. When is there going to be an approval order? And it’s just not something that I can weigh in on. Timing is difficult to predict, for one. And the second thing is that each one is judged on its merits. And each one is slightly different. Each one is organised differently, is designed differently. So I think what people need to do is let the regulatory process play out. They need to continue making the case whatever they think. Whether they’re in favour or against, continue making the case. Because obviously convincing one Commissioner that this might be the way to go is not going to win the day. You’ve got to convince more of us than that, especially we have five. So that means you probably have to convince three of us that a particular product should go forward. Peter McCormack: Is it a case that you spend time discussing and trying to convince the other Commissioners? Is that how it was? Do you debate it together? Hester Peirce: Yeah. So, the interesting thing about the way The Commission runs is that we have this law called the Sunshine Act, which means that if we’re going to discuss something all of us together, we can only do it in public. Unless it’s enforcement. There are exceptions for things like enforcement, which you can have a private meeting. You’re obviously not going to do that in public. So we can have one off conversations with each other, but it’s never going to be the five of us sitting in a room debating whether a particular product should get approved or not. But certainly, my colleagues know that I feel strongly about us trying to think about these from a positive direction in the sense that we need to think about how they fit within our rule book, and we need to not just assume that because it’s crypto or digital assets or whatever you want to call it, that it raises all these new issues. It does raise some new issues, but some pieces of it fit very neatly within what we already do. Peter McCormack: Right okay. So I’m trying to think carefully sometimes how to word through these questions, because obviously you have to be certain way you can reply. But do you feel that an ETF will be inevitable, is inevitable? Hester Peirce: Well, I don’t think I could say anything is inevitable. I think that there’s a lot of interest from investors from institutional and retail. And from the exchange community, and from sponsors of these products. So I think there’s a lot of intellectual capital being put into addressing some of the concerns. So we have futures markets for example. Those are relatively new. But again, we’re getting experience. Things are getting more developed. So I can’t say that that anything is inevitable, but I can say that given the amount of time and energy being spent in this area, I think it’s definitely possible that we could see products that are based on cryptocurrencies in our markets. Peter McCormack: Right, okay. And what are the remaining primary issues for an ETF to be approved? Hester Peirce: Well, I think people ask me that. And I think again, I have to emphasise that it’s a case by case consideration. So because some of these really are designed quite differently from one another, so I think you have to take that into account. But you can get guidance by looking at the orders that we’ve put out. So the Winklevoss order was one, and then the order that the staff put out does give a sense of where the concerns are. So I think people can address those concerns. Peter McCormack: So, it feels like it’s an ongoing relationship therefore with The Commission? Here’s our response. They can go away and they can work and resubmit, right? Hester Peirce: I like that way of describing it. It’s a conversation that we’re having and so there are different iterations in that conversation. So, I think people have to listen to what the other folks, what in this case The Commission is saying and respond to those concerns. So I think that’s a good way of describing it. Hester Peirce: Yeah, I think it does start to set markers of what you might expect to see in an application. But again, understanding that different people might approach it differently and might come up with different solutions. But yeah, it certainly starts to set a precedent. And I think then once people see how these products actually trade, that’ll also help to inform The Commission as it thinks about what it wants to do with future applicants. Peter McCormack: Okay. Well, I think we’ve done enough on ETFs there. So, let’s get back to the wider work that The SEC is doing. It feels to me, as I mentioned earlier, it’s been in phases. So it felt like phase one was the outright scams. Phase two, it felt like with Paragon and Airfix that you are enforcing the regulations that already exist in the same with EtherDelta. I feel like maybe there’s another phase coming now where it will be precedents that you set with those will be used to bring action against all the rest of the ICO. Is that a good picture of what’s happening? Hester Peirce: Again, I think we do really think about these things on an individual facts and circumstances basis, and we have to. So no two of these things are identical, but I think that we’ve taken we had the DAO report, and that was a signal. Hester Peirce: One thing that I really would like to emphasise is that I think we’re bringing enforcement actions, but we also need to provide some guidance that doesn’t come in the form of enforcement. So I’m eager for us to maybe provide some guidance that comes in the form of guidance, not actually an enforcement action. I don’t think that’s the best way for people to understand what our thinking is, just to see us bringing enforcement actions. Peter McCormack: Yeah. It doesn’t feel like you just want to harm the industry. It feels like you want to enforce the regulations that are there, but help support the industry to grow to something that can benefit wider communities and wider people are interested in building with these products, that you can’t ignore if regulations have been ignored. Hester Peirce: Yeah. And I think that is the issue that we’re facing is that people have been raising money through the sale of securities for, for many, many years. Right? And we’ve put a particular framework in place and so when people come up with a new way of doing it, we’re going to think about how that interacts with the framework we already have in place. Peter McCormack: Right. So when you start looking maybe at an ICO, what are the powers that you have when say if they’ve broken regulations? What are the powers you have? Hester Peirce: Well, we can place an injunction on someone which basically says you have to comply with the law. We can impose penalties. We can force people to register. Force is a strong word, but people can be asked to register their securities with us. Hester Peirce: Now a lot of these enforcement actions not only in this area but in many areas are done through settlements which are negotiated settlements. So if we go to someone and we say we’re thinking of bringing an enforcement action against you, they can say, “Let’s not fight this out in court. Let’s just come to an agreement and settle it.” So those are going to be tailored again to the facts and circumstances, but we have some typical types of remedies that we do engage in, and sometimes it’s just to say now that the information is out there, why don’t you give investors the opportunity to say we’re not interested? Because at the time that they bought the securities, they should have had access to that information. Now give them the access to the information and see whether they still want to stay invested or not. Peter McCormack: Right, okay. So it feels like you really want to avoid litigation then? Hester Peirce: Well, I think litigation takes a lot of time and money on both sides. So a lot of our enforcement actions tend to be resolved through settlements. No, that’s not always a good thing. Sometimes it is good to take the issues and hash them out in court. So that a court can weigh in and say, “We look at the law differently than you The SEC looks at it or than you the person The SEC is suing looks at it.” So that can be helpful. But it’s expensive and time consuming. Peter McCormack: For both sides? Peter McCormack: And in looking at the future cryptocurrencies, do you think the market will benefit from greater clarity and therefore will be able to develop further if they have a full understanding of what The SEC considers the compliant way to run an ICO? Hester Peirce: Yeah, I think so. I think it’s always helpful for people to understand how The SEC interprets its own rules as they apply in the ICO context, and then people can really think about, is this the best way for me to raise money? Maybe it is for some and it isn’t for others. But I think we also need to think about some of the more difficult issues that are maybe unique in this context. So you might have something that’s an ICO where it starts out really as you trying to raise capital from people to whom you sell tokens, but eventually those tokens might be something very different than securities. So how do we tell people when that line has been crossed? Hester Peirce: Then I think one of the issues that would be helpful if we provided more guidance about what we actually think is a security just so that the platforms that are trading these things have a sense of what’s in and what’s out. Because whether or not they’re trading securities, then flows into whether or not they have to register with us as an exchange. Hester Peirce: So, part of how these enforcement actions work is that the staff will work on, the staff is constantly working on enforcement actions across the board about lots of different things. Then they’ll prepare a recommendation for us, and it’ll come up to us. And often that recommendation will come in the form of we’ve investigated this entity X, and they’ve agreed to settle. And here are the terms of the settlement. What do you Commissioners think of the settlement? Peter McCormack: Right, okay. So you must have an awful lot of work on at the moment. Hester Peirce: We do have lots of work about lots of different types of issues related to crypto and non-crypto alike. So we’re busy. And enforcement regulations, so we do have a lot on our plates. Peter McCormack: So, have you grown quite a big crypto team here then? Hester Peirce: Well, I think the chairman is trying to build a team under vows to panic as I mentioned. On my staff, I have someone who works on crypto issues, but she also works on many other issues. So I don’t have one person who’s dedicated just to those issues. Peter McCormack: Does The SEC look at privacy tokens at all? Is that something that comes under your lens? Hester Peirce: Well again, I think we’re going to look at any token from the perspective of is it a security? And if it’s not, then it falls outside our jurisdiction. Peter McCormack: Falls then to somebody else. How much do you work with the other regulators? Hester Peirce: So, we do have a lot of interaction with the other regulators again, on a range of issues. But the cryptocurrency is one of those issues. I think that’s an area that is possible for some really fruitful work just because again as we talked about, there’s so many regulators and trying to figure out hey, where do I enter this regulatory framework and who do I go to first? If we could have a little more coordination on, “Hey just come in and talk to one of us, and we’ll help you get to the right place.” I think that could be helpful. So I think there are efforts underway to try to work both with domestic regulators, but also to talk to other regulators around the world and say, “Hey, how are you approaching these issues?” So I think there have been some really positive discussions. Hester Peirce: You’re essentially part of the crypto community now in one way or another, you’re out on Twitter. You’ve had quite a few people obviously follow you and interested in what you’re saying. What’s your overall picture of the market? What do you make of it? Hester Peirce: Well again. To me it’s really exciting to see people who are excited about the work they’re doing. I love seeing the fact that people are challenging each other’s work and so there are some people who believe really strongly in one particular approach to doing things and others come in and say, “No, we can do it faster and consuming less energy. We have a way to make things more efficient,” or, “We have a way to better incorporate lots of different ideas from the community.” So to me it’s exciting to see people who have such deep knowledge, and who are really applying it and thinking of ways that they can apply it to make certain functions in our society work better. So from that perspective, that’s what I love most about the community is just the positive potential for doing something for society. Now again, some of it is going to succeed and some of its going to fail is my guess. And so it’s really fun to watch people who are engaged and believe in their ideas that they’re pushing, and are working hard at them. Peter McCormack: Is it unique compared to the other markets that you regulate and look at? Hester Peirce: Well, it’s unique in the sense that it tends to be a different group of people. I think that’s great too. Right? So we have a financial industry that is dynamic and innovative, but it’s also a little bit more conservative. Right? So you have people coming in. Conservative not in the political sense, but conservative in the sense that we’ve done things in a particular way for some time. So you have people coming in from the outside and saying, “Hey I have a new idea about how you might do X, Y, and Z.” So it’s always great to get fresh ideas into the space. And I think that’s true of the financial system, that’s true of any other part of our economy. So yeah, it’s a different group of people, and that’s why I think it’s exciting to see them bring in. You always want people to come in and say, “Hey I know you’ve been doing things this way for a long time, but can we think about doing it this way? And if we do it this way, would we be able to involve more people in the financial system and would we be able to really improve people’s lives?” I love that possibility. Peter McCormack: You can see that. Every time we get onto the point of something to do with tech innovation, you can see that’s something that excites you. Peter McCormack: I think but like you said, that’s a very American thing, right? Hester Peirce: It’s a bit of an American thing. Yeah, I think it is. But I think that’s one of the things that we’re all hoping for is that we can make changes that will then help something to work better in our society or help someone’s life to be better in our society. And that’s the core of why I came to this job, because capital formation is all about getting money to people who have ideas about how they can make the world a better place. So that’s the function of The SEC, to set the framework within which people can do that. So when I see a new technology that says we’re going to be able to crash through some barriers that have been there and make it easier for a wider swath of people to be involved, I think that is exciting. Hester Peirce: Well that’s kind. But again, the real exciting work is happening among the entrepreneurs, the people who are really applying their knowledge and thinking of new ways to solve problems. So I think that’s where the real excitement is. Peter McCormack: Well I think it’s happening everywhere. I think this conversation is part of it. I think is an innovative technology. Hester, what do you do outside of regulations and Crypto? Are you a football fan? Peter McCormack: Did I read something about Condoleezza Rice perhaps becoming head coach? Hester Peirce: No, that is not a question I was expecting to get asked. But I read something about that too. And then I cannot speculate, that’s certainly outside of my purview, but I thought it was interesting to read. Peter McCormack: I did. Because the Cleveland Brown are struggling right? Hester Peirce: The Cleveland Browns are doing great. Peter McCormack: I thought, didn’t they have two head coaches go recently? Hester Peirce: Again, I have to stick to the line that the Cleveland Browns are … No, they’re actually having a great season this year. Peter McCormack: So, you’re from Ohio? Hester Peirce: I am from Ohio. Peter McCormack: Are you a Buckeye? Peter McCormack: Got a big game coming up this week, have you against Michigan? Hester Peirce: Yeah. No I’m from Cleveland, so I am a Buckeye. You can take the girl out of Ohio, but you can’t take the Ohio out of the girl. Peter McCormack: So, you’re surprised I know this, aren’t you? Hester Peirce: I am. I’m impressed. Peter McCormack: I was dating a girl from Ohio last year, and she made me become a Buckeye. She got me into college football. Peter McCormack: And I’ve been invited. Because I’m going to New York after this, and all my friends in New York have said, “No we’re not here. We’re away for Thanksgiving.” So I’ve been invited to Ohio for Thanksgiving. Hester Peirce: There’s no better place you could be. Peter McCormack: Hester this has been amazing. I’ve really, really enjoyed this and thank you so much for allowing me to come here and do this. Hester Peirce: No, thanks for having me on. I appreciate it. Peter McCormack: It’s fantastic. A year ago, I was unemployed, and a year later I’m in The SEC interviewing a Commissioner. Don’t know how this has happened. Just some final thoughts. What can the wider people do in the Bitcoin and crypto community to better help themselves and better help The SEC and you do your work? Hester Peirce: Well again, I encourage people to come in and talk to us. It’s sometimes a little daunting to come talk to a regulator. But if you’re trying to do something that you really think will help improve society, it’s usually good to try to figure out how you can do that within the regulatory framework. Hester Peirce: So I encourage people to come in. I love it when people come take the time to talk to me. I realise people are busy and so talking to a regulator is not always a fun thing to do. But it is helpful just to educate me and help me be able to better say and understand how maybe there’s some pressure points that we can address at The SEC. If I don’t know what’s going on, it’s really hard for me to figure out where those pressure points in difficulties might be. Peter McCormack: Right. And lastly, how should people stay in touch? And I know you said people shouldn’t follow you on Twitter because you said you’re quite boring on Twitter, it’s all regulatory stuff. Hester Peirce: Well, I write about regulatory stuff. So I don’t really anticipate that people would find my tweets very interesting. But all is welcome, people to communicate with me that way. If you’re really trying to get in touch with me, it’s best to email commissionerpeirce@sec.gov. Peter McCormack: Brilliant. Thank you so much for coming on. Hester Peirce: Thanks for having me.